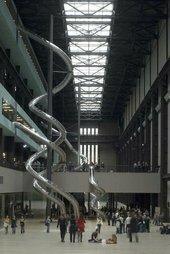 Read about the work of Carsten Höller, Henry Moore and David Musgrave in this issue, along with articles about the interpretation of art by Tony Bennett, Griselda Pollock and Donald Preziosi from the conference Interpretation, Theory & the Encounter held at Tate Britain on 9 July 2010. Tate’s current Social Media Communication Strategy is also presented. A video recording of Tate Britain conference Interpretation, Theory & the Encounter with James Elkins - Can Pictures Think?